Meshuggah is a very, very, very strange band. They have no sense of marketing, as it would seem to most by their odd release schedule. They have a strange fixation with dark psychadelia, psychological conditions, and human delusion, as evinced by many of the lyrics written by their drummer, Tomas Haake. They experiment with off-kilter time signatures in a way that most bands couldn’t even try to pull off. This new album from them, Catch Thirtythree, is probably their oddest effort to date. A strange effort from a strange band, Catch Thirtythree is so weird chiefly because of the fact that it’s really just one song long. They just broke it up into sections since not many people are going to listen to one 47 minute song without entertaining the delusion that the different sections of it are actually different songs. In short, you’d better have some patience if you want to get the most out of this album. The production is like polished glass- clear, sublime. Obviously it was self-produced, not only because they’ve gotten very good at that since I, but also because the experimental nature of this album would make it difficult for any other producer to do it, because he’d end up just doing exactly what they said. The guitars are very loud and downtuned, but not in that sloppy way that nu-metal guitars sound. Their odd, angular riffs sound like clear slabs of diamond, hitting the ear crisply. The vocals are as good as they get from Kidman, who is really a love-or-hate sort of vocalist. Now, something quick to get over: The drums are programmed. They don’t really sound very programmed, in fact they sound a whole heck of a lot like Tomas playing with a few more triggers, but they’re programmed. If that bothers you, fine, don’t listen to the album. They didn’t do it because they were lazy- it was done this way because they wanted the guitar parts to fit with the drum parts and they were constantly changing the guitar parts throughout the recording process. To record all that with real drums… gaah, it would have taken twice as long to finish the album. So don’t bother bitching about the damn drums and listen to the album. The music is… um… weird. It’s mostly the same riff throughout the whole album, but it’s constantly moving and morphing in a subtle, intoxicatingly addictive manner. Reminds me of a huge tank of maggots when it comes to constant movement of everything in the back and foreground. Or perhaps the blackness that you see when you close your eyes- you can track and watch individual shadow-shapes there, picking and choosing what you want to focus on amongst the many individual things to see, because it is only there in the first place because you wish to see it. With Catch Thirtythree, seek and ye shall find what you have sought. Highlights include The Paradoxical Spiral for its bulldozer mentality- it’ll continue running you over and not care, Mind’s Mirrors for brave attempts to switch things up with a dose of atmosphere and robotic vocals and for making me wonder whether or not I was dead, and if self-realization was, indeed, hell , In Death – Is Life for being plain ol’ interesting in terms of odd structure, In Death – Is Death for being a thirteen minute song with more switches and twists and turns then you could find in all of Nothing, Dehumanization for seemingly showcasing utter ferocity from the source of anger itself, and Sum for being, quite simply, the best Meshuggah song since Future Breed Machinee in terms of riff, tone, never-gonna-stop intensity, and jazzy weirdness that is still as undeniably metal as you can get with jazz. Don’t get me wrong- there are flaws to Catch Thirtythree, quite a few, which is the reason for such a ‘low’ score. For one, seven out of the thirteen songs are just plain uninteresting. Not only that, but listening to the good songs out of the thirteen breaks thing up and doesn’t make them sound as good. Basically, you have to sit through the whole album each time you want to hear Dehumanization as good as it can get, and that annoys me. The beginning is monotonous and plain, like Nothing itself. Do I still think you should rush out and get this album? For certain, but only if you have patience. 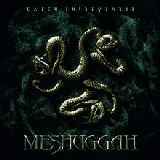 That’s the watchword with this, the newest of Meshuggah albums. Happy listenings, and remember, it’s all in your mind.